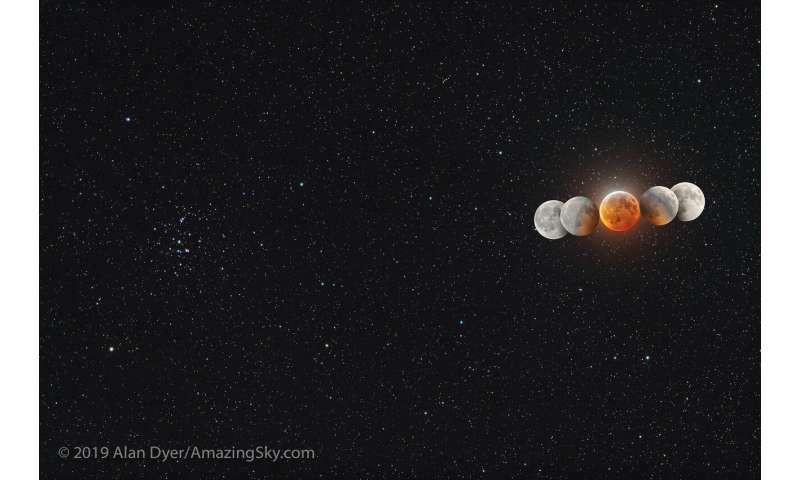 The only total lunar eclipse for 2019 was an amazing spectacle for the Americas late Sunday night on January 20th and early Monday morning on January 21st for Africa and Europe. Like millions of other observers, we braved chilly January temperatures to watch the moon take on a ruddy hue during totality. Totality for this total lunar eclipse was also a descent length, at one second shy of an hour and two minutes in duration. We caught the total lunar eclipse from the beach in Tarifa, Spain. We estimate totality was a brilliant Danjon Number of 3 for this total lunar eclipse, as it took on a classic brick-red tone near mid-totality. This is in line with what observers have seen in previous years recently, as total lunar eclipses—even ones venturing relatively deep into the dark shadow umbra of the Earth—have all been fairly bright. Many observers also noted a bluish tinge on the upper bright limb of the moon. 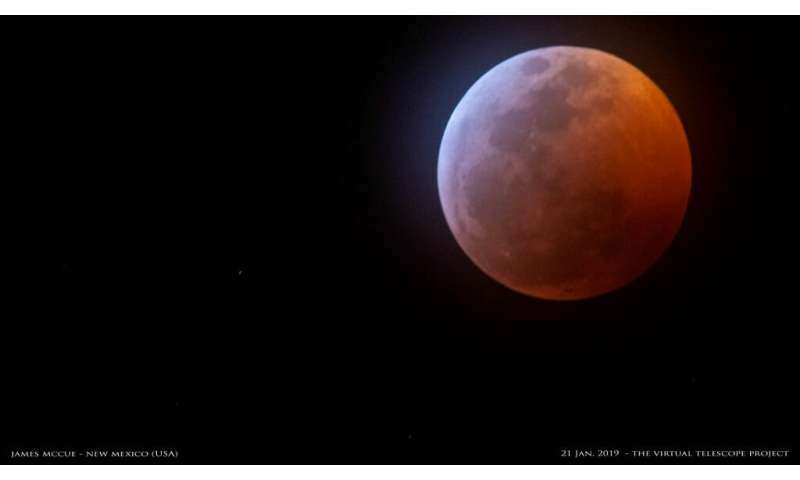 This interesting aspect of the recent total lunar eclipse was the result of a relatively dust and aerosol free atmosphere here on Earth, failing to filter and scatter out blue light refracted into the shadow umbra cast back on the moon. But it was actually a flash near the limb of the moon that caught many an observer's eye. The event occurred around 4:41:43 UT on January 21st, under half a minute into totality. Discussion of the impact flash across Twitter sent many an observer (including myself) scrambling to look back over images and video… unfortunately, we had snapped stills just a minute prior to and after the event! Fortunately, lots of video was running featuring the eclipse worldwide, and soon, several videos confirmed the event. The event was as a +6 or +7th magnitude flash, just a split second in duration. The location was estimated by Justin Cowart near coordinates 29.47 south latitude, 67.77 west longitude +/- 4 kilometers, very near the 11 kilometer diameter Lagrange H crater, west of Mare Humorum. Due to the short duration, video was much more likely to nab the flash than still images, but it's always worth reviewing and checking both. Petr Horalek observing from the Cape Verde islands was one of the first imagers that noticed the flash during image processing. The flash turned up as a suspected 'hot pixel' that had actually bled over into surrounding pixels, a telltale sign characteristic of a real event and not an image artifact. Astrophotographer Christian Fröschlin also caught a fine video and image of the event. There's also the possibility that NASA's Lunar Reconnaissance Orbiter may manage to conduct a followup imaging pass over the region, and see if any new fresh impact craters turn up. The moon is now waning gibbous as it heads towards New phase on February 4th, and the suspect region remains illuminated until early February, when the two week lunar night descends over the impact site. Of course, the ongoing shutdown impacting NASA may mean this imaging opportunity window may come and go, though its always possible to image the site during a future lunation. Seeing impact flashes on the dark limb isn't new: NASA has maintained a vigil looking for meteorite impacts on the dark limb of the moon during crescent moon cycles, as has the European Space Agency's NELIOTA program. 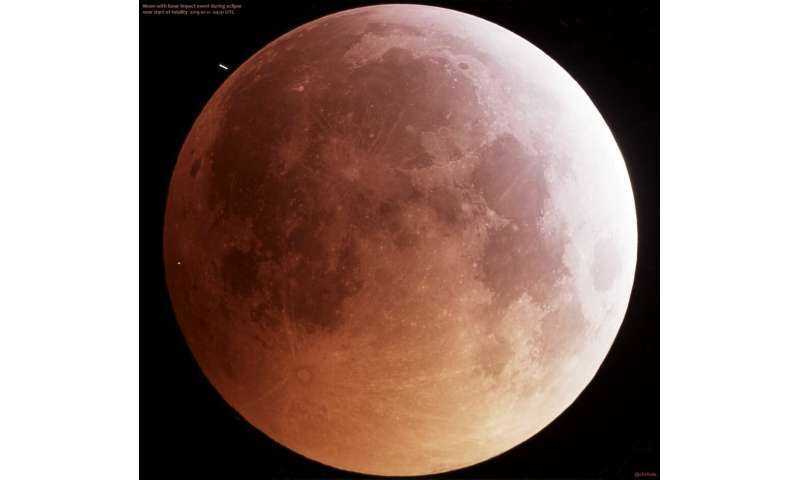 The first documented impact flash during a total lunar eclipse occurred in 2008, and more will probably turn up, as folks aim continuous HD video on the moon worldwide. In fact, NASA has established a rough average rate of one visible impact flash on the moon per two to three hours of continuous observation, so it's not surprising that one might turn up during over an hour of totality. The lesson here is: it's always with carefully reviewing video and images after an astro-event: you never know what might turn up.